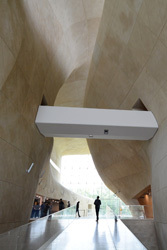 An international architectural competition for the Museum of the History of Polish Jews was organised in spring 2005. The first discussions regarding the plan to build such a museum had taken place ten years earlier. During those years it had become clear that there is a need for a dedicated museum as public interest towards Jewish history and culture had increased. The selection of the participants of the architectural competition was based on expressions of interest. The finalists included 11 studios, including Studio Daniel Libeskind, Kengo Kuma & Associates, Zvi Hecker Architects, Peter Eisenman and David Chipperfield. The proposal “Yum Suf”, “Sea of Reeds”, by Lahdelma & Mahlamäki Architects was declared winner in summer 2005. The design process of the building continued until July 2008 when final design documents were released. The construction commenced in July 2009. The building is scheduled to be completed by May of 2013. The museum will function as a multifunctional centre for the research and exhibition of Jewish heritage, education and culture. The main permanent exhibition takes place under the main hall in a large exhibition space of 5000 m2. Special built-in milieus will present the different aspects of the history of the Polish Jews. The main task of the exhibition is to present different phases and forms of Jewish culture starting from medieval times to present day – the holocaust is only one of the main themes of the exhibition. Warsaw has been one of the most important cities for Jews; before the Second World War there were half a million Jewish inhabitants in the city.The site of the new museum is located in the Willy Brandt Park, one kilometre from the old city centre of Warsaw, which was rebuilt after the war. The history of the park is tragic as it was part of the Jewish ghetto during the war. Adjacent to the new museum is the memorial of the uprising in the Jewish ghetto. The memorial has been an important element in the architecture of the museum. The proportions of the plaza in front of the memorial and the museum have been carefully considered. The shape of the museum building is rectangular. The facades will be covered with glass and copper panels. The name of the competition proposal symbolically refers to the architecture of the main hall. The inspiration for the space has been the legends of the Old Testament, although at the same time forms of the hall refer to the universal and abstract phenomena of nature. The main hall is the most important element in the architecture of the building; a pure and silent space introducing the museum to the visitors.